Engaging Families, Intervention Visits, Practical Strategies, Service Coordination, What Would You Do? You are here: Home » Engaging Families » The Baby Cries During Every Intervention Visit…What Do You Do? You call Rordan’s mother for your monthly contact to check on services and ask her how things are going. She sheepishly tells you that Rordan has made little progress with his crawling and that she doesn’t think he likes physical therapy much. When you ask why she thinks he doesn’t like it, she tells you that he cries during every visit and that he’s even started crying when he sees the PT walk in the door. She’s not sure what to do and she wonders if other children find therapy to be so hard. 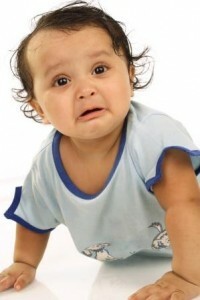 I don’t think early intervention should be so difficult or miserable for a child that he cries each time. A little fussing now and then isn’t necessarily a bad thing, especially when, for example, the child doesn’t get his way and is pushed a bit out of his comfort zone. Think of the toddler who hasn’t had to make any sounds to get what he wanted now being expected to use a sound to get his cup – not always a happy camper at first but this passes when he learns that sounds get him what he wants. However, this is very different from a child who finds intervention to be so challenging that he cries each time the provider comes to the door. Who is doing what during the visit? – Find out who is interacting with the child during the session and what that person may be doing (or not doing) that is so upsetting to the child. Why does the parent think the session is such a challenge? What would she/he like to see happening differently? – It can be easy to “blame” the child for not cooperating but the problem usually lies with the adults. Ask the parent for insights. What does the therapist think is happening during the visit? – Gathering information from everyone involved is always important. This is probably a very challenging visit for the therapist too. What is the purpose and structure of each visit? – If the purpose of the visit is for the child to “get through” the therapy session and the visit is structured by the PT stretching the child, then you’d need to question how appropriate this is to the mission of early intervention. Is this a good match between the service provider and the family? – Sometimes it’s just not a good match and that’s okay. Many families won’t ask for a change of service provider because they don’t want to hurt the provider’s feelings so the service coordinator can offer this option to see if it is what’s needed. Could there be a medical issue that is impacting intervention? – A good question for the entire team, including the pediatrician. I collaborated with a family years ago who had a child who cried often during visits. Eventually she was so fussy that they took her to the ER and she was found to have undiagnosed hydrocephalus. I’ve also seen this with another child with multiple disabilities who had dislocated hips and required very specialized handling. So if you were Rordan’s service coordinator, what would you do? How would you get these questions answered? Would you schedule to join and observe the next intervention visit? Would you schedule an IFSP meeting with the parent and PT present to discuss these challenges? Would you change providers right away? If you were Rordan’s therapist, what suggestions would you have? Share your ideas for this situation in the comments below! As an interventionist, this has happened to me many times. Sometimes I feel that it is a stage that the child goes through paired with what may be too challenging of a therapy session. I am very open with the parents and discussing the crying and try to problem solve it with them and take recommendations from the parent on how to make the sessions more positive. I find that sometimes having a session where the child is minimally challenged by therapist and parent, the next session tends to be more positive. I also found that changing the location of the session (either a different place in the home or out in the community) can break the ‘crying cycle’ and make it a more positive therapy session for everyone. I completely agree that stepping back and reducing the challenges for a session can “reset” things. Changing the location or activity is another effective idea. In the end, we want children to enjoy intervention and not realize they are “working.” These are great practical suggestions for making that happen! Thanks Lisa! I have personally been through this with my son. Trying to get creative on how to do the therapy can help. My son ended up having sensory issues and was later diagnosed with autism spectrum disorder, and still to this day doesn’t really like to be touched, is very emotionally sensitive, and is very selective on the people he interacts with. When I mentioned his heightened anxiety levels to his multiple therapists, we got creative on ways to help him complete the therapy exercises in less traditional ways. The therapist taught me different ways to practice the skills with my son at home outside of therapy, and it worked wonders, since I was more in tune with his energy and emotional cues. If he started showing signs of anxiety, I simply stopped the exercise, and tried it at a different time, and/or tried a different way to get the same exercise accomplished. The therapist did less direct hands on with him, and instead coached me with handouts with pictures and showing me what type of exercise we were trying to do (on a baby doll). Once we did this, my son’s anxiety and pressure immediately lessoned, and we still did all of the exercises that was suggested. We had to get creative and fun with the exercises. The end result—my son sat up, walked, ran, jump, climbed, and walked balance beams—-all without anxiety, pressure, and had a blast doing the exercises. Get creative, think like a comedian (Jim Carey or Robin Williams). There are plenty of creative ways to do certain exercises. Listen to your gut—find a therapist the listens to you and your child, and who will pay attention to your child’s emotional sensitivity and cues. Thanks so much for adding your wonderful insights and experience to this post, Davia! Reading about what worked for you and your son will enrich the advice EI providers get here on this blog. I love your suggestions to get creative – I completely agree that we can and should find ways to accomplish therapy without stressing the child out. I’m so glad that you and your son had a good experience!